LEVI�S TRUCKER BLEACHED DENIM JACKET ( GRAY ) SIZE - XL. LEVI�S TRUCKER JEAN JACKET ( LIGHT BLUE ) SIZE - XL. Benefits Of This 2 0 1 5 Levi's Neppy Jean Jacket Below. ☆ Trucker Jean Jacket. Levi's Premium Sherpa Lined Jacket. Listed Size: Large. Sleeve Length: 25.5" (from the top shoulder/sleeve seam to the end of the cuff). Amazing Tie DyeLevis Trucket Jacket. Condition is Pre-owned. No t ag s ve ry g oo d co nd it io n li ke n ew N OT v in ta ge. Cu rr en t Ty pe I II T ru ck er j ac ke tin size m edium/large. Light Blue Wash. Size 42 / Large. Made In USA. Levi Denim Jacket Size XL. Condition is Pre-owned. Shipped with USPS Priority Mail. Brand new condition! Here is a really nice Levi's denim jacket for you. In excellent condition. Seems almost new. All the buttons are there and none are loose. The inside patch is pristine. I have included a couple of pictures of the jacket inside out so you can see I am hiding nothing. Black with a slight acid wash. Great condition! Levi Jean Jacket XL. Condition is Pre-owned. Shipped with USPS Priority Mail. Button front. 2 chest pockets. 2 hand pockets. Rare find & in great condition! 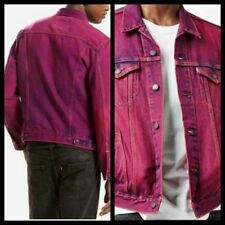 Mens Levis Dark Blue Classic Jean Jacket 3XL. Condition is Pre-owned. Shipped with USPS Priority Mail. 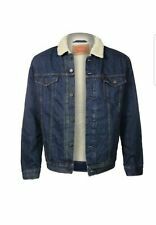 Levis Limited Patched Trucker Jacket Denim Mens Size M New. Shipped with USPS Priority Mail. Mens Levi Strauss Signature Denim Trucker Jacket T4 Pocket Size Small. Shipped with USPS Priority Mail Small Flat Rate Box. Condition is Pre-owned. •Color : Blue Denim. •Style: Denim Jacket. •Size : XL. •Sleeve: Long. •Material : 100% Cotton. •Weight: 2lbs. •Neckline: Collared. Condition is Pre-owned and in good condition. HAS GREAT LOOKING MILD FADE. NICE JEAN JACKET! Levis Trucker Jacket Hudson Bay blanket edition. Perfect condition. Size large. LEVI’S TRUCKER JEAN JACKET ( LIGHT BLUE ) SIZE - L.
Excellent Jean jacket. Very cool and stylish. Awesome color. Brand new! The color of the vest is dark green. Levi Struass Signature Denim Trucker Jacket Blue Button Up Men’s Size M Medium. Condition is Pre-owned. Shipped with USPS Priority Mail. The original jean jacket since 1967. Our iconic truckers are fit for anything and made to go the distance. Levi's Classic Two-Horse Patch inside & Levi's Red Tab Device on front left pocket. 100% Cotton. Brand: Levi’s Item: Denim Jacket Size: Mens Large (Measurements are in pictures to help with sizing) Condition: Pre-Owned (See pictures for further details, some light distressing) Shipping: This item will be shipped out within 1-4 days of purchase. Check out the rest of my eBay page for similar great deals!! We would love to hear how your experience buying with us went. Be sure to leave your feedback once you secure your item! There are also 2 large pockets inside on each side. Total length from the center of the back at the collar to the hem is 30". Great condition. It is never intentional. I will work to make it right with you. There is general, overall fading with no fraying. Freshly laundered. A classic, with a lot of life left in it! 100% Cotton. No can do.